Co-edited by Mark Elliott and David Feldman, The Cambridge Companion to Public Law was published by Cambridge University Press in 2015. A copy of the editors' introduction can be accessed here. 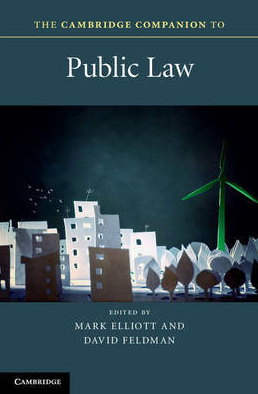 The book examines key debates and issues in contemporary public law. In particular, it identifies and draws out five key themes: the notions of government and the state; the place of the state and public law in the world at large; relationships between institutions and officials within the state; the legitimacy of institutions; and the identity and value of public law in relation to politics. The book presents a contemporary examination, taking account of the substantial changes witnessed in this area in recent decades and of the resulting need to reassess orthodox accounts of the subject. Written by leading authorities drawn from across the common law world, their approach is rigorous, engaging and highly accessible. The book acts as both a thoughtful introduction and a collection that consciously moves the discipline forward. The book is comprised of the following chapters: The Distinctiveness of Public Law (David Feldman, University of Cambridge); The Politics of Public Law (David Howarth, University of Cambridge); The Rule of Law in Public Law (Jeremy Waldron, NYU); Legislative Supremacy in a Multidimensional Constitution (Mark Elliott, University of Cambridge); The Politics of Accountability (Tony Wright, UCL); Rights and Democracy in UK Public Law (Aileen McHarg, Strathclyde University); Public Law Values in the Common Law (Mark Aronson, UNSW); Public Law and Public Laws (Paul Craig, University of Oxford); Public Law and Privatisation (Anne Davies, University of Oxford); State Architecture: Subsidiarity, Devolution, Federalism and Independence (Christopher McCrudden, Queen's University Belfast); Soft Law Never Dies (Richard Rawlings, UCL); The Impact of Public Law Litigation (Maurice Sunkin); Designing and Operating Constitutions in Global Context (Cheryl Saunders, University of Melbourne).